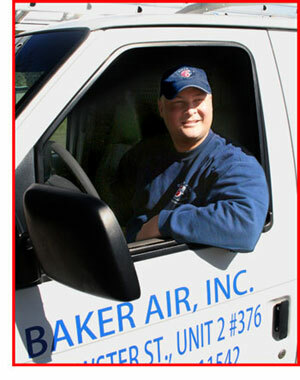 With a small-company touch, Baker Air delivers a prompt courteous service and a knowledgeable staff. Owner Kris Baker, grew up on Long Island, and as a young boy trailed behind his dad, an air conditioning and heating expert who had a passion for his work. He learned how to inspect and change filters before he learned how to master the art of bike riding! As an adult, that same passion his dad had for his work inspired him to enter the HVAC profession. He made it his mission to become a master of the craft, working with heating and air conditioning companies and gathering the knowledge he needed to “take the leap” and build a team of industry experts dedicated to providing our customers with the highest quality service possible on Long Island. Integrity: We are forthright and truthful in our dealings with our customers. Excellence: We design, install, service and repair HVAC systems and parts in accordance with the highest industry standards. Knowledge: We continuously strive to form one of the broadest knowledge bases in our industry. Our reputation rests on extensive knowledge, training, and enthusiasm coupled with years of experience and schooling. But it won’t stop here….we will continually seek new methods, products, and ideas that will help us not only set the pace for our industry, but also continue to provide our customers with the quality and professionalism they have come to expect. Competition: We value fair competition. We advertise promote and market our brand fairly and accurately and in a manner that reflects the high standards of Baker Air. On a personal level, Kris is a husband, father and Army veteran. This, along with the experience he has as an HVAC expert, is a formula for success. The only way to achieve this is through your continued business. Call Baker Air and let us be the heroes to your HVAC needs!